Powers/Abilities: He is able to generate and project radiation in various forms, including blasts of force and heat. He can also use his powers to mutate others. 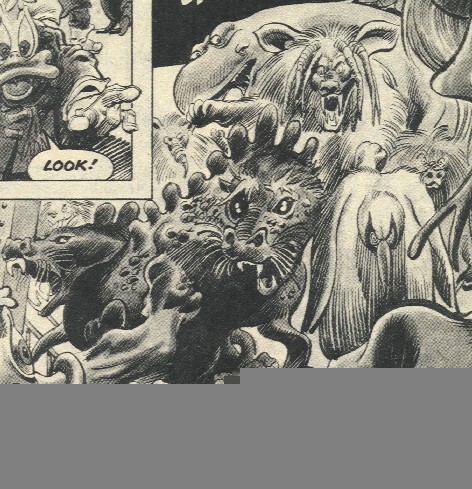 In addition to Pinball Lizard, he mutated a number of creatures indigenous to the North Pole. However, his mutates only remain in that form until he ceases concentrating on them. (Howard the Duck II#3 (fb)) - His mother used to tell him "You can't make pies with rotten apples!" (Howard the Duck II#3 (fb)) - The man who would become Greedy Killerwatt was formerly employed at Three Mile Island nuclear facility as a "Jumper"--a worker hired to enter 'hot' areas of nuclear plants to do various tasks. This generally involved absorbing more radiation in seconds than the average nuclear worker absorbed in the course of a lifetime. Eventually he fell ill: "By the time they hauled me out of there, I was glowing like a lightbulb!" 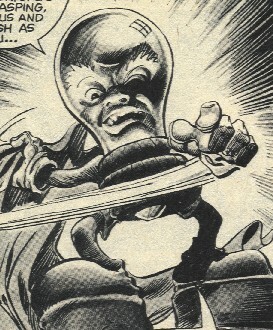 Ironically, his body had chosen to make the same analogy, as he began to mutate into the form of a living lightbulb. Eventually, however, he felt better--stronger than ever before. His abnormal appearances caused others to shun him. Growing to hate those who had taunted him, he decided to steal away their laughter by stealing away that which they held most dear: Christmas. As part of his "Christmas Caper," Greedy Killerwatt (as he now called himself), mutated an ex-con to become his agent: Pinball Lizard. Killerwatt then plotted to destroy the world via a nuclear meltdown at the North Pole. The highly-radioactive super-thermal nuclear fuel would theoretically "melt down" through the Earth itself, boring a molten tunnel until it reached Antarctica, where it would shoot out the other end of the planet. Then, like a punctured gasbag propelled by escaping air, the planet would whiz crazily through space, deflating and, finally, self-destructing. Killerwatt--acting through less-threatening agents--convinced Santa Claus to license him to build the North Pole Nuclear Power Facility on his workshop land. As his plans approached readiness, Killerwatt had Pinball Lizard trap Santa Claus away from the North Pole so he could initiate the "Antarctica Syndrome." My Laughter is your sorrow! 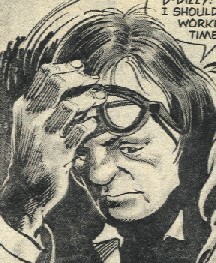 Howard and Carol proved unable to stop Killerwatt, but they did delay him long enough for Sunquist to take him out with a bullet that shattered his glassy dome. With his downfall, all of his mutates returned to normal. Comments: Created by Bill Mantlo and Gene "The Dean" Colan. You young'uns may not remember Three Mile Island, but it is a nuclear power plant in Pennsylvania, which had a small meltdown on March 28, 1979. I was so close to it that I could actually see the reactors of Three Mile Island from my high school window (though I wasn't in high school at the time of the meltdown). Anyway, it's been overshadowed by Chernobyl and other more recent disasters, but it was a big deal at the time. This film is a political thriller about a news crew that accidentally witnesses a control room crisis at the fictional Ventana nuclear energy plant; the news team photographer surreptitiously shoots the event. 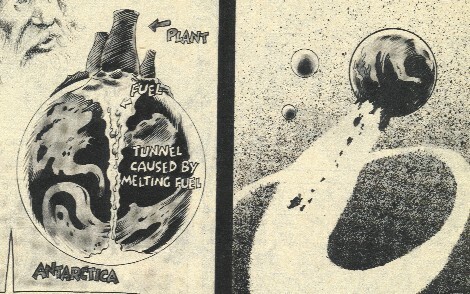 Mike Gray wrote the first draft of the screenplay in 1974 based on a real event at the Dresden II reactor near Chicago in 1970 due to the stuck needle of a water level gauge. Another draft was written in 1975 based on another real event at the Browns Ferry reactor in Alabama on March 22 when a fire disabled the cooling system and almost uncovered the fuel core threatening a 5000 degree meltdown nicknamed "The China Syndrome--I'd guess that this was also theoretically (or at least jokingly referred to) going to melt a hole to China. Horrible, ugly, ghastly, execrable, outrageous, frightful, shocking, hideous, mutated monstrosities that were obviously once poor, innocent seals, polar bears, penguins, and whales. They were mutated by Greedy Killerwatt and used as his fighting force. They fought Santa Claus, his elves, and some of their toys. However, when Killerwatt was defeated and possibly slain by Sunquist, they reverted back to normal. Killerwatt tricked Santa Claus into allowing him to create this facility on his Workshop Land and use it as the major power source. With it he planned to cause a meltdown and destroy the Earth via the Antarctica Syndrome. With Killerwatt's defeat, the Nuclear Facility was shut down and Santa Claus began to convert his Toyshop back to solar power, and his sleigh back to organic fuels.